Rye grain infected with ergot fungus. Photo courtesy of Brad Smith via Flickr. Did a fungal outbreak in France give rise to the modern organic garden movement? GV contributor and food and garden expert Alan Jackson offers one take. There is a fungus of the family Clavicipiaceae that infects grass crops, including wheat and rye, and it has among its 50 or so members a pathogen known as Claviceps purpurea, or ergot, from which the hallucinogenic drug LSD (lysergic acid) was first synthesized. 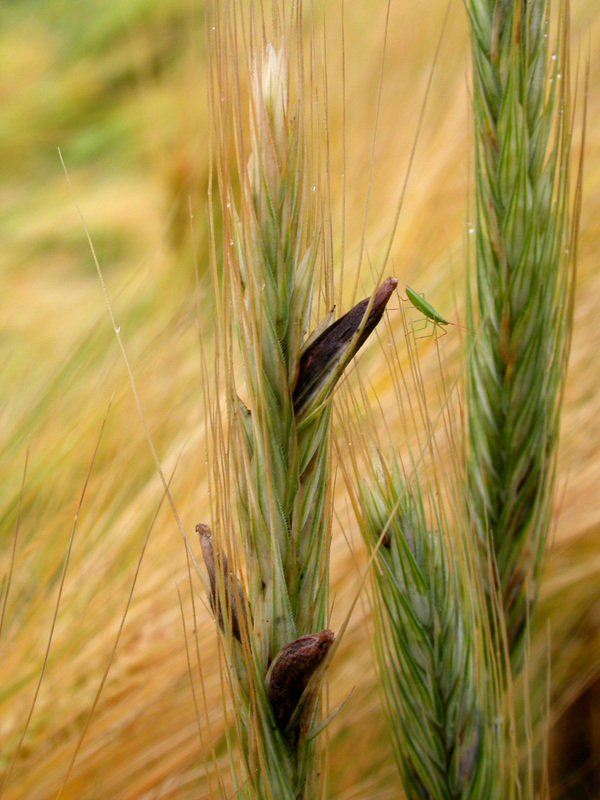 Ergot has an affinity for rye grain and it found paradise in French large-field monoculture. During what historians call the Great Fear of 1789, the peasant population of Paris rose up and stormed the Bastille, the city’s most fortified structure. It was an act of pure lunacy and while the prevailing theory is the uprising was triggered by hunger and rising food prices, some historians attribute it to delusions and mass paranoia caused by ergot poisoning linked to the consumption of bread made with contaminated rye—the same thing some say contributed the Salem Witch Trials. The chaos exploded into a full-blown anarchy, known as the French Revolution, marked by the carnival-like executions of some 50,000 people—eventually including King Louis XVI and Marie Antoinette—until clearer minds began to suspect ergot infestation and put a stop to the use of rye grain in bread production. Paris and much of the nation had unwittingly experienced a drug trip, a surreal and macabre bit of history celebrated today as Bastille Day. In the aftermath, all French grains became suspect, resulting in a return to small grain fields with pathways to allow for government crop inspections. In 1890, Parisian experimental gardeners took compact to the extreme by layering a 2-acre plot 18 inches deep with aged horse manure and placing seeds so close together that, when mature, they formed an indefinable mass that refused weeds even a flicker of sunlight. The experiment was deemed a great success and after refinements it was officially named French Intensive Agriculture and became the basis of low-space, high-yield square-foot and raised bed organic gardening methods. Poisons of the Past: Molds, Epidemics, and History by Mary Kilbourne Matossian (Yale University Press, 1989); available for as little at 1 cent to $19.99, depending on condition, on Amazon.com. Toronto-based Garden Variety contributing writer Alan H. Jackson offers an informed perspective on the methods, background, history and lore of food and gardening. A former food broker, greenhouse-garden center owner and golf course head gardener who has pursued rare orchids in Asia, produced bananas in South America and cultivated vanilla beans in the South Pacific, Alan has experience with everything from tropical fruit production to cold-climate vegetable farming. He is author of a dozen books, including “Beginning Gardening for Canada” (Lone Pine) and “The Canadian Food Encyclopedia” (Company’s Coming), which was just published. CORRECTION: This post was originally incorrectly attributed to our European correspondent Mike Alexander. It should have bore Alan H. Jackson’s byline. This entry was posted in History, Organic Gardening, Uncategorized and tagged A.H. Jackson, Alan Jackson, Clavicipiaceae, ergot, ergot poisoning, French Intensive, French Revolution, gardening history, Organic Gardening, organic gardens, plant fungus, rye fungus, wheat fungus. Bookmark the permalink. That is fascinating! I have never dared to try growing a grain…maybe there’s a reason for that. It’s extraordinary that something as game-changing as the French Revolution could have been sparked by hallucinogenic bread! Loved this! Bring on more history! This is quite interesting, that ergot is some nasty stuff!